The legendary F-14 Tomcat’s six-on-six missile shot test. The F-14 Tomcat, which was conceived towards the end of the 1960s as a multimission fighter able to defend U.S. Navy Carrier Battle Groups (CVBG) from the raids undertaken by the Soviet bombers armed with long-range cruise missiles as well as to dogfight against the most agile fighters, was fitted with the most powerful radar to be mounted on a fighter til date, the AWG-9. 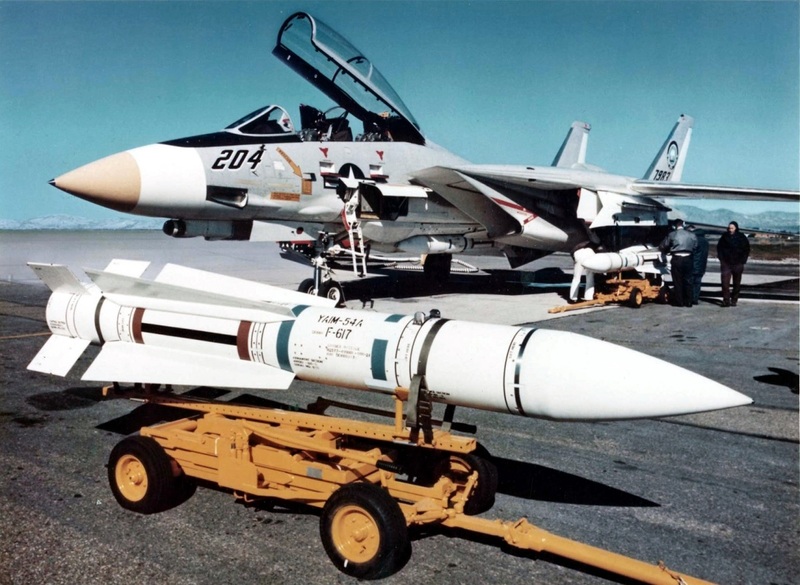 Of the many weapons which the AWG-9 could support, the AIM-54 was the biggest, the most lethal and had the longest range of any air-to-air missile in the world. The Phoenix introduced many new capabilities and fixed many limitations of the precedent missiles, such as those that affected the AIM-7 Sparrow. As explained by Rear Admiral Paul t. Gillcrist in his book Tomcat! The Grumman F-14 Story, the first innovation introduced by the AIM-54 was an impressive range of about 100 miles (160 km), a great improvement over the 15 miles of range possessed by the Sparrow: thanks to this characteristic in fact the Phoenix was the ideal weapon to respond to the threat posed by Soviet bombers and their cruise missiles. The second new capability introduced by the AIM-54 was strictly linked to its radar: the AWG-9 in fact had the unprecedented ability to track 24 targets and attack 6 of them simultaneously. Thanks to its weapons system the F-14 was the first fighter in the world able to engage more aerial targets at the same time. Again, the Phoenix was the first “fire and forget” missile, meaning that the Tomcat had not to keep its radar locked on the target during the flight of the AIM-54 towards it, a feature possible thanks to the small Phoenix radar, which guided the missile in the final stages of its flight. The fourth innovation introduced was the high resistance of the AIM-54 against counter measures, a very important characteristic in every modern air-to-air warfare environment. The most important shortcoming fixed by the Phoenix was instead the so called “end game:” actually any other missile after its rocket motor having burned out, started to lose speed quickly, leaving the target the chance to maneuver, lowering the probability of kill of the missile. The “end game” performance of the Phoenix was dramatically increased thanks to its unique trajectory after the launch: in fact, since its rocket motor had better performances at high altitude, the AIM-54 climbed to 80,000 feet, at a speed between Mach 4 and Mach 5. After rocket motor burned-out the Phoenix started the descent, converting the altitude in velocity and maintaining its ability to turn against a maneuvering target. 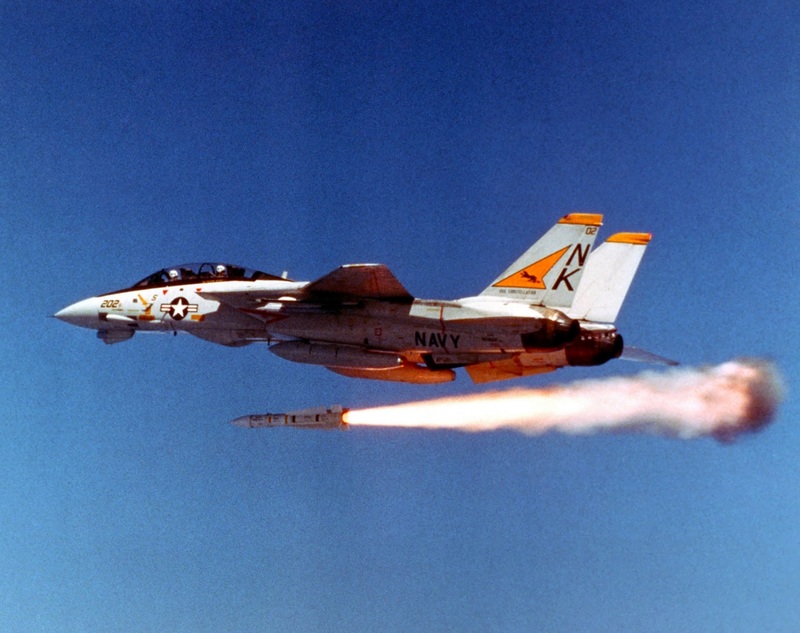 To verify the effectiveness of the new Phoenix capabilities, an extensive test campaign was conducted between 1972 and November 1973: even if these tests resulted to be the most expensive series of air-to-air missile test firings in history, they were necessary not only to demonstrate the strength of the Tomcat weapons system, but also to determine the fate of the F-14 itself since it was built around the AIM-54 concept. 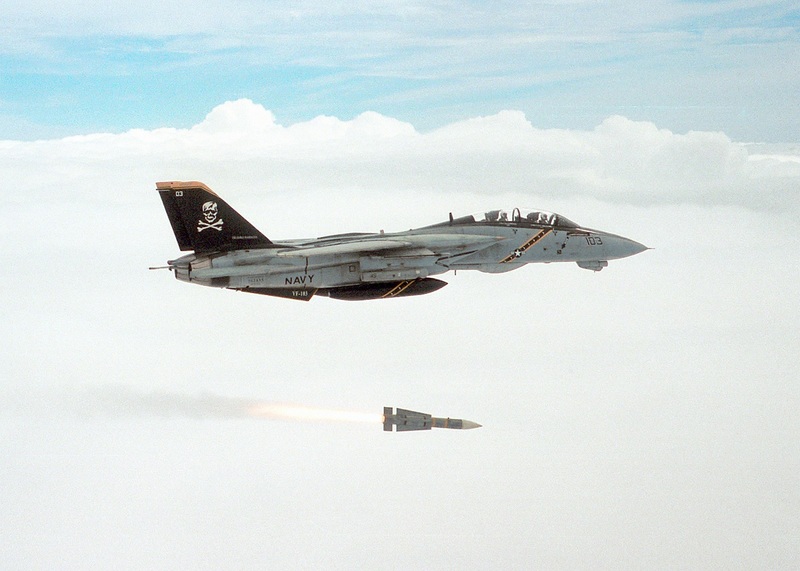 The aircraft that took part in the live missile firing programme were two: F-14A-15-GR, BuNo 157983 (the fourth Tomcat built) and F-14A-40-GR, BuNo 157988 (the ninth Tomcat built). The AIM-54 launches from Tomcat started on Apr. 28, 1972 against a wide variety of (simulated) target types, such as cruise missiles, high altitudes bombers and fast maneuvering fighters. One shot also occurred from an extreme distance, when an F-14 engaged and shot down a target drone from a distance of 120 miles (193 km). The final test was conducted on Nov. 21, 1973, when the so called six-on-six missile shot took place. That day Commander John R. “Smoke” Wilson Jr. and his Radar Intercept Office (RIO) Lieutenant Commander Jack Hawver, the crew who carried the whole Phoenix test campaign, took off from Point Mugu (where it was based the Pacific Missile Test Center, the former name of the current Naval Air Warfare Center) with their F-14 armed with a complete Phoenix load: four were on pallets in the semi-submerged wells in the underside of the fuselage and two more AIM-54s were mounted one on each wing station pylon. This time they had to launch their six missiles against six different targets simultaneously. Once Wilson and Hawver reached 25,000 feet of altitude, they launched all six missiles over a period of 38 seconds. The targets against which the AIM-54s were launched were three QT-33s (the drone version of the old jet trainer), two aerial target BQM-34As and one BQM-34E. Wilson launched the first Phoenix, while Hawver launched missiles two through five, with the last AIM-54 launched again by Wilson. The missiles were in flight together under guidance from the fire control system in the Tomcat and four targets, which were simulating bombers (two QT-33s, one of the BQM-34As and the BQM-34E), were directly hit. The other BQM-34A experienced a failure at the flight control module which led the Phoenix radar to break lock, while the last AIM-54 missed the last QT-33 due to a failure of the Phoenix radar antenna. As also the following video (which actually is the original six-on-six missile shot clip) shows, the test ended with a score of four direct hits, with one AIM-54 missing its target due to the BQM-34A avionics breakdown. 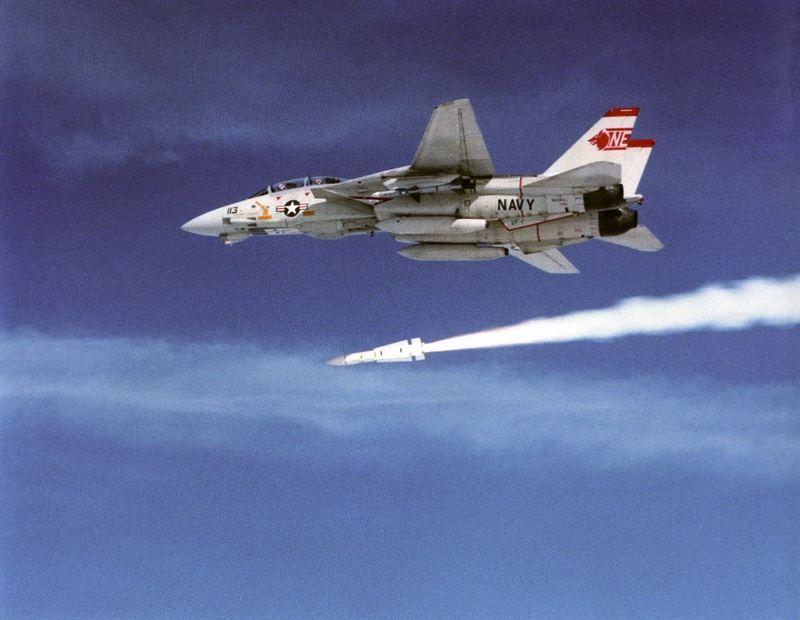 The six-on-six missile shot was considered a huge success, since demonstrated that both the F-14 Tomcat and the AIM-54 Phoenix missile were ready to enter active service.